The Earth is slowing down and wobbling on its axis. How does a clock meant to keep accurate time for 10,000 years account for these long-term celestial variations? Fig. 1. The Equation of Time Cam. In the collections of the Royal Observatory of Greenwich, amongst the myriad time-keeping and navigational devices of the past, there sits a curious artifact built to last into a future none of us will witness. Standing half-a-foot tall, it looks more like a sculpture than an instrument of time, with slender curves that lend it the appearance of a human torso. It is a prototype of the Equation of Time Cam, a mechanism that will be in The Long Now Foundation’s 10,000 Year Clock. The Equation of Time Cam solves one of the crucial design and engineering problems in building a clock meant to last ten thousand years: keeping accurate time while accounting for the slow but significant changes in the Earth’s rotation over the millennia. Human societies have always organized their activities around the rising and setting of the Sun. Civilization required agriculture. Agriculture required sunlight. Much of human culture is organized around a diurnal or annual cadence. […] The Sun matters to humans, even to their devices in the depths of space and on the surfaces of other planets. It has done so throughout history and the Clock makes the statement that it will continue to matter thousands of years into the future. The Clock keeps time with a pendulum, which generates absolute time.¹ The sun is used to correct any drift. 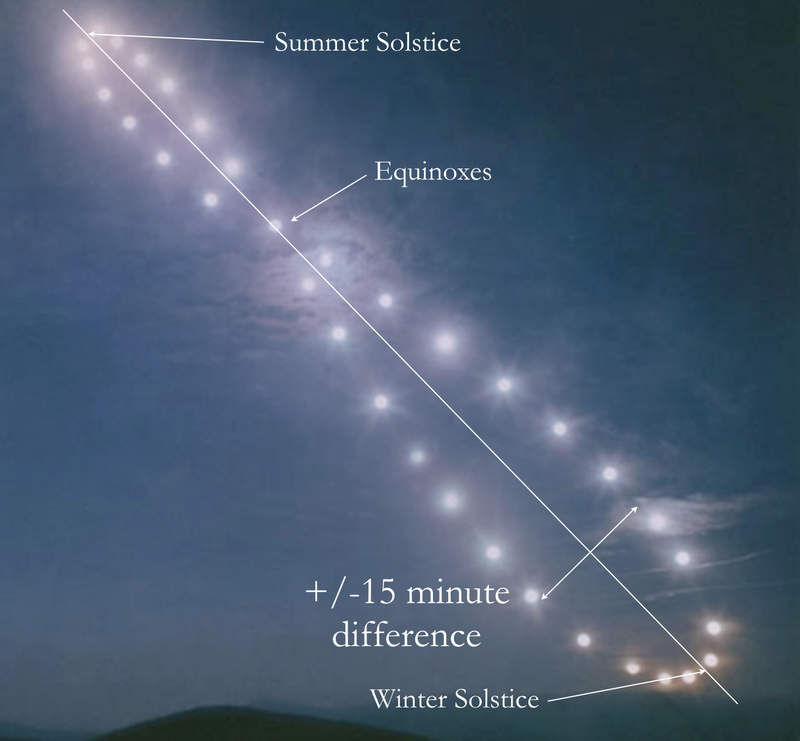 On the sunny days around the solstices at solar noon, a shaft of light will shine into the mountain where the Clock resides, synchronizing it to the sun and providing the input of solar time. But there’s a discrepancy between solar time and absolute time. That’s because the position of the sun at solar noon throughout the course of a year is not regular. It varies due to the Earth’s elliptical trajectory around the sun (called the eccentricity of Earth’s orbit) and the Earth’s axial tilt (called the obliquity of the ecliptic). This variability is represented by a diagram called an analemma (Figure 2). Fig. 2. The analemma showing the sun’s position at solar noon over the course of one year. Note the plus or minus fifteen minute time difference. If you were to visit an accurate sundial at exactly noon on a sunny day in mid-February and looked at the time on your watch or phone, this discrepancy would become especially apparent: your watch or phone would read 12:00, but the shadow cast by the sun on the sundial would correspond to 11:46. If you were to do the same on a sunny day in early November, the opposite would be true: 12:00 on your timekeeping device would correspond to 12:14 on the sundial. The equation of time reconciles the difference between these two kinds of time. It converts solar time to clock time, and vice versa, such that over the course of a year the differences resolve to zero. Fig. 3. The Equation of Time as it appears today. Note the four times over the course of the year where solar time and sundial time align. 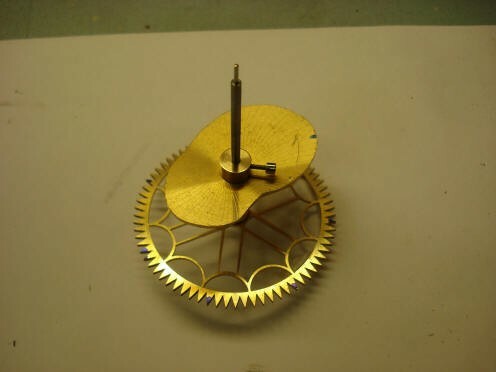 In the early eighteenth century, astronomical regulator clocks were invented that used equation of time cam mechanisms that automatically converted clock time to solar time. The two-dimensional cam, shaped in such a way to embody the equation of time, would rotate once a year, with a follower that traveled around the curves. Fig. 4. Left: A Graham astronomical regulator clock. 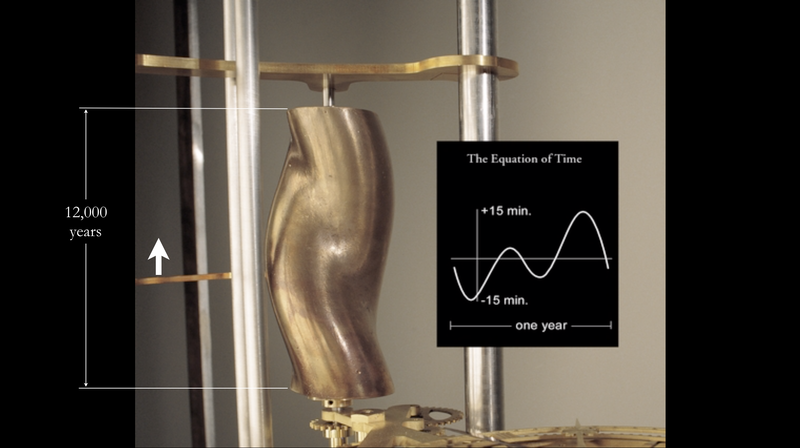 Right: A two-dimensional equation of time cam. These traditional equation of time cams would not be sufficient for purposes of reconciling time in the 10,000 Year Clock. That’s because they’re designed to correct for the same analemma year after year. They do not take into account slow, long-term changes in the Earth’s rotation. These variations would scarcely be perceptible over the lifetime of a normal clock, but on a long enough time scale, such as 10,000 years, these changes would be profound, and would result in errors for purposes of timekeeping. Fig. 5. The “wobble” of the Earth during the Precession of the Equinoxes. The first variation in the Earth’s motion that must be accounted for is its cyclic wobble, called the precession of the equinoxes. Like a spinning top, the Earth gradually shifts the orientation of its axis, and completes a cycle after roughly 26,000 years. Today, our axis points to the North Star, Polaris. In 8,000 years, we will have a new North Star: Deneb. In 12,000 years, our North Star will be Vega. The second variation is the fact that the Earth is slowing down by 1.8 milliseconds per day, or roughly one second per century. This is due to a number of factors, including the tidal effects of the moon, shifts in the Earth’s crusts, and changes in sea levels. If you were to synchronize two clocks 2,500 years ago, with one keeping perfect time and the other based on solar time, these clocks would be out of sync by four hours today. Fig. 6. The moon accounts for some of the Earth’s rotation slowing down over time. Fig. 7. The Equation of Time Cam. But the Clock’s builders wanted to do more than simply turn a mathematical equation into its physical representation. They wanted to create an object that would be aesthetically compelling to visitors of the Clock for millennia. Fig. 8. The evolution of the Equation of Time Cam prototype models. Fig. 9. The Equation of Time Cam over the coming thousands of years, with the equation of time visible at left. The cam rotates once each year, with a follower slowly moving up the cam until the year 12000. Danny Hillis enlisted engineer Stewart Dickson to create a three-dimensional model based on his derivations of the equation of time. 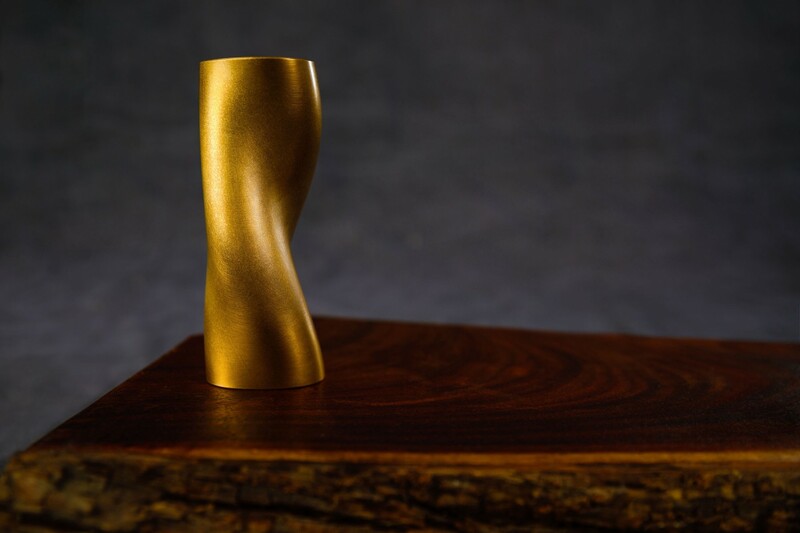 The Cam for the first prototype of the Clock was built using a 3D printer, and then cast into bronze. This work was carried out at The Crucible under the direction of fabricator Chris Rand. After the first one that was made for the Clock, Levenger made an edition of 365 Equation of Time Cams, most of which were given as a thank you for Long Now members at the “Equation of Time Cam” level of membership. Fig. 10. The prototype of the 10,000 Year Clock. The Equation of Time Cam is visible in the top left, below the Clock’s face. In 02018, a new numbered edition of the Equation of Time Cam was created. These cams are made of bronze and entirely machined similar to the one now being made for the monument scale Clock. This next edition is available via donation on Long Now’s “Artifacts” page. Fig. 11. 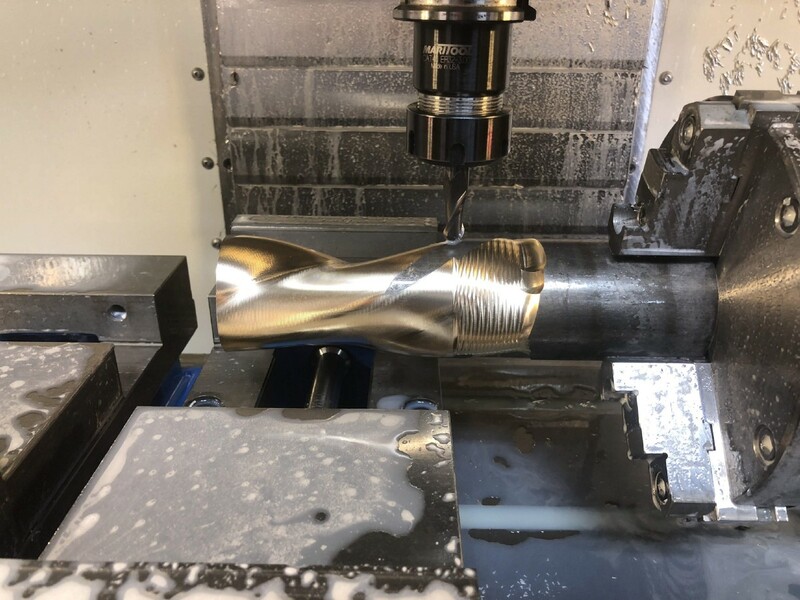 Machining the new edition of the Equation of Time Cam. 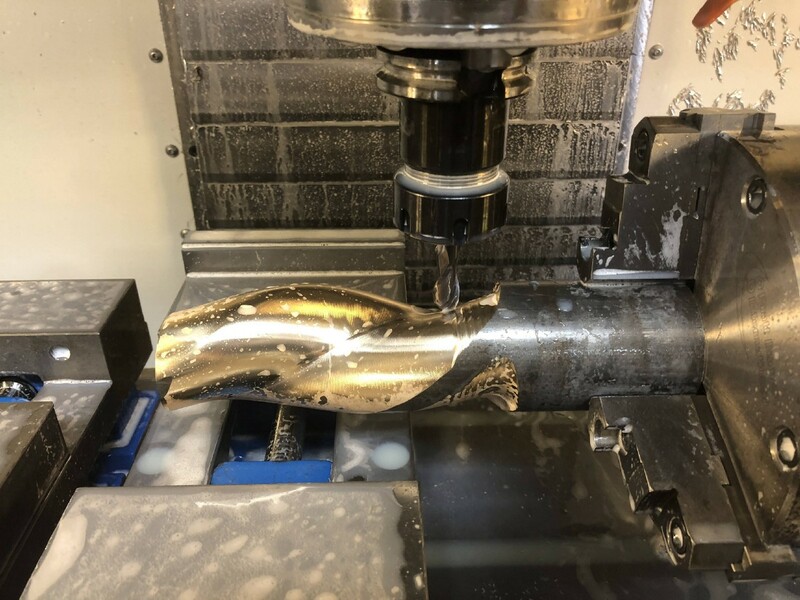 02018 also saw the construction of the full-size stainless steel Equation of Time Cam for the monument scale clock. 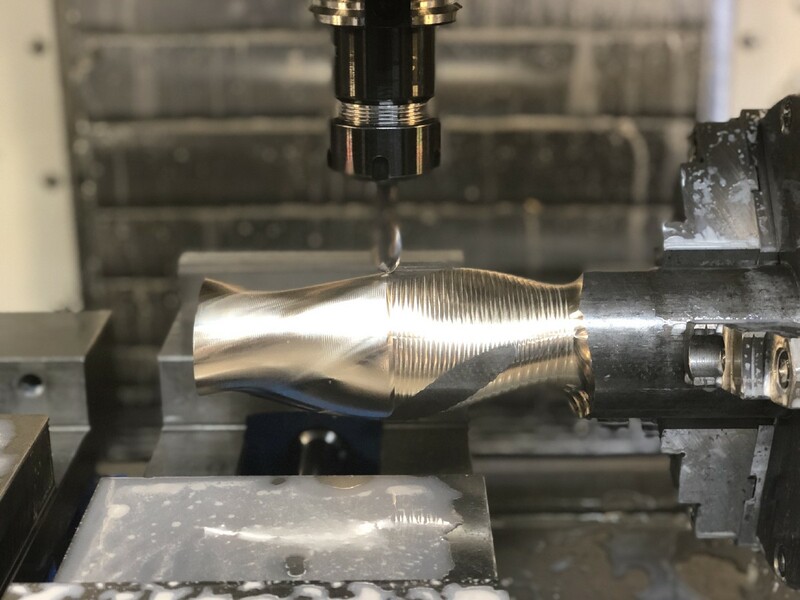 Compared to the prototype Equation of Time Cam, which stands at six inches tall, the full-size cam will be 10.2 inches — one inch per thousand years with a little extra room on either end. This extra room provides future engineers with a window of roughly 100 years to create a new Cam. Fig. 12. Construction and assembly of the full-size Equation of Time Cam that will be in the 10,000 Year Clock. In examining the question of what time was, Saint Augustine once said: “If no one asks me, I know what it is. If I wish to explain it to him who asks, I do not know.” The Equation of Time Cam ensures that the Clock of the Long Now will — for the next ten thousand years, at least — always know. While the Equation of Time Cam is precomputed to correct for celestial variations over time, there’s one variable that potentially places a limit on the Clock’s accuracy: climate change. As noted above, rising sea levels are one factor that slows the Earth’s rotation over time. The Earth’s predicted slowdown is accounted for in the Equation of Time Cam, but calamitous climate change events could slow it down even further. In 02010, Danny Hillis requested a paper from astrophysicist Michael Busch to assess the impact of the most dramatic predictions of climate change on the Clock’s accuracy. Busch found that if the ice sheets of Antarctica or Greenland were to melt completely — which could take centuries, i.e., less than the total timespan of the Clock — it could affect when solar noon is by 37 days over the course of 10,000 years. Learn more about the Equation of Time from the Monthly Notices of the Royal Astronomical Society. Watch Alexander Rose discuss the design challenges of building the Clock of the Long Now in a 02018 Google Talk. Curious about how climate change could impact timekeeping in the Clock? Read Michael Busch’s 02010 paper. What we mean by time continues to evolve, as it has for millennia. Read Charlotte Hajer’s 02011 essay on the nature of civil time. Browse Long Now’s new Artifacts page, where the new edition of Equation of Time Cams are available via donation.